Huffington Post: Leonard Nimoy Explores Secret Selves and "Dangerous Territory"
Sometimes a guy gets called “Renaissance man,” and many guys (to their peril) call themselves that — but rare and wonderful is the real deal. Consider the application form: Master of multiple arts? Erudite intellectual? Poet, polyglot, polymath, pillar of society? Maybe even: Larger-than-life persona? Risk-taker and rule-breaker? Well, check, check, check, and so on. I recently spoke with one of these guys, a real-deal Renaissance person. You’ve probably heard of him. His name is Leonard Nimoy. Now, interviewing Mr. Nimoy is a pleasure, but it’s also somewhat tricky. So storied a career — six decades of elegant acting, dynamic directing, poignant poetry, velvety vocals! — prompts in the jocular journalist a plethora of quirky questions, such as: “What’s it like being totally amazing constantly?” and “Do you have any single daughters?” and “Pon Farr — how’s that goin’ for ya?” But these we cast aside, for today we discuss Mr. Nimoy’s career as a fine artist, a passionate lifelong photographer. The occasion centers on Secret Selves, Mr. Nimoy’s latest show and catalogue of photography, for which he recently presented seminars in two Los Angeles locations: at Westwood’s beautiful Hammer Museum (where he covered the project and greeted the audience in conversation with the “new Spock,” Zachary Quinto); and at Century City’s elegant Annenberg Space for Photography (where he expanded the Secret Selves lecture into an exploration of the Sacred Feminine as well as a truly fascinating oral autobiography). Throughout, Mr. Nimoy appeared as a charming and sophisticated cultural hero at the top of his game. It was awesome. 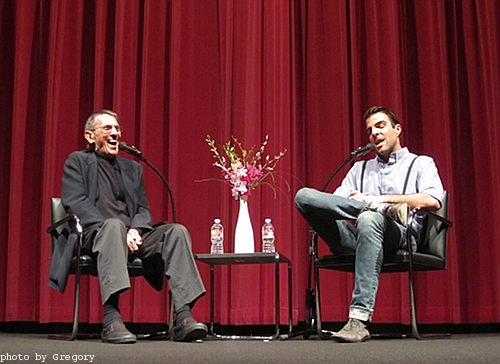 Spock on Spock: Leonard Nimoy and Zachary Quinto at the Hammer. Warming up, we talk technique. In circles of professional photography, it is well-known that Mr. Nimoy began snapping images in 1940s Boston when he was 13 (on the family camera, which he still owns), and in the early 1970s he studied at UCLA under avant-garde photographic artist Robert Heinecken — from whom he may have absorbed the philosophy, “There is a vast difference between taking a picture and making a photograph.” I ask him how he feels about the radical shift from celluloid to digital.